Former University of Wyoming Fay W. Whitney School of Nursing Dean Dr. Marcia Dale, EdD, RN, FAAN, passed away at the Davis Hospice Center in Cheyenne from multiple myeloma on August 18, 2012. Pictured, Marcia Dale poses in 2010 with her new book, "Climbing the Peak" - the history of the UW School of Nursing from 1951-2001. Marcia Dale retired from the University of Wyoming in 2003 after serving as dean of the school of nursing since 1993 and after rendering 42 total years of service to the University of Wyoming. Dale's association with the university began with her undergraduate studies and earning her BSN in 1960. Following the completion of her master's degree from the University of Washington, she returned to UW as a nursing instructor. Marcia was made a full professor in 1975 before completing her EdD from the University of Northern Colorado in 1981. Dale served as associate nursing dean from 1983 to 1993, when she became dean of the nursing school. During that time, she was named the 1985 School of Nursing Distinguished Alumna. She continued to receive laurels from the university, being named College of Health Sciences Alumna of the Year in 2007 and Distinguished Alumna from the University of Wyoming in 2009. She remained in close contact with the school, serving on the "Friends of the Fay W. Whitney School of Nursing" development board up unto her death. 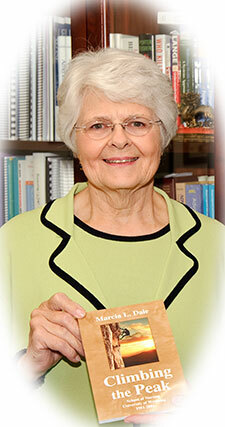 Dale wrote the first book on the history of the University of Wyoming School of Nursing entitled, "Climbing the Peak". The book, covering the years 1951-2001, was published in 2010. Dale said that she wrote the book to fulfill a dream of Dorothy Tupper -- one of the first nursing instructors at UW -- who had expressed a desire to write the story of the school but had died prior to fulfilling that goal. Dale's career as nursing instructor and dean touched many lives. A former student's sentiments are shared by all: "She was a great lady, and I looked up to her. I am aware of her many years of service to the school of nursing and beyond. I will be forever grateful for what she taught us!" Another former student and present school of nursing faculty member shared, "One of the many things I appreciated about Marcia was her true wisdom of teaching. She was a wonderful mentor for all faculty, especially those new to the teaching profession. The loss of her wisdom is what I will miss most." Outside of University service, Dale also served as president of several nursing organizations in Wyoming, including the Wyoming Nurses Association, the Wyoming State Board of Nursing, and the Wyoming League for Nursing. Nationally, Dale was among the first three nurses from Wyoming to be accepted as fellows of the American Academy of Nursing. She established a national peer group of 10 school of nursing deans to serve as a forum for sharing ideas in regards to improving nursing education. Dale also led the first site visit for the national Commission on Collegiate Nursing Education (CCNE) accrediting organization. Being involved in the broad picture never lessened Dale's empathy and concern for the individual. In 2000 she and her husband Bill established a scholarship fund for UW nursing students. Dale noted, "My admiration for students who were struggling to improve their lives led Bill and me to establish a scholarship that would ease the burden of paying tuition, buying books, and in some cases, paying for daycare. Seeing the recipients succeed and become professionals is very rewarding." The Dales have also funded a graduation award for the BRAND accelerated BSN program students. In closing, a quote from a UW School of Nursing graduate perhaps best summarizes the communication we have received over Marcia's death from the grieving academic community: "I graduated in 1985 and even today Marcia Dale's name brings back wonderful memories of my time at UW. Her dedication to our profession is inspirational and she will be missed."